Westering home and a song in the air... What a craft presentation of an unpeated Islay Single Malt with a lovely natural color in the glass! The nose is elegant and amazingly complex with Mon Chéri confectionery, old leather and mild spices. Rich nut aromas, orange peel and raisins disguise distant hints of sea air. Intensely aromatic and yet well-balanced in the taste, you get distinct oakiness, stewed tea and dried fruits with honey, leading into a long, warming and peppery bitter finish. Bunnahabhain 18 is a high class all-rounder, even without peat! Thanks to Slàinte Mhath (and Feorag86) for this sample. Rich sherry, red berries, sugared orange. Dark chocolate, coffee, Some peach. Some furniture polish. Maybe what others get as a "sea breeze", but I get a faint whiff of fresh mint. Gentle peppery spice, with some fresh crushed basil. Mouthfillingly rich at the get go. Very well in tune with the nose. Chocolate, coffee, toffee. The taste of nutmeg linger with a refined oakiness. Full-bodied heavy and dark aromas pour out of my glass. Characteristic Sherrynoten are very present from the beginning: plum jam, figs, raisins, overripe grapes, juicy oranges and abundant dark fruits I perceive. A salty sea breeze lays like a thin veil over the other flavors. The alcohol (46.3%) is not noticeable and very well integrated. As the nosing continues, many more aromas crystallize. Ample nuts, dark forest honey, hints of caramel, a touch of leather and a beautiful, spicy woody note complete the multi-faceted nose. In the background a tender smoke flag blows. Great! Beautiful, creamy mouthfeel, the onset is slightly sweet and very sherrylastig. A light pepperiness prances on the tip of the tongue, while the complex flavors unfold on the palate handsome. The alcohol content is perfectly integrated and always gives the malt sufficient strength. Old, intense Sherrynoten dominate the taste events. Red, cooked fruits, plums, raisins and juicy oranges I perceive. Plenty of nuts, burned caramel, pipe tobacco, hints of leather and chocolate, gingerbread and strong-spicy oak notes create a harmonious taste experience. The maritime veil with plenty of salt still lies above the various flavors. The smoke, which is still very delicate in the nose, now draws more attention to itself, but remains pleasantly light in the background. Medium to long, maritime, sweet and spicy and slightly smoky. With a small pinch of pepper on the sparkling tongue tip, the finish starts. The powerful sherynots are beginning to fade. With nuts, chocolate, salty-maritime aromas and spicy notes of oak wood, the Bunnahabhain sounds. A slight smoky note ensures a round end point. On the palate remains a slight dryness. The 12-year-old Bunnahabhain is already a classic and a really very complex malt and a balanced counterpart to the wild south of Islay. This 18 year old puts a lot of complexity on top of everything and everything comes here a lot more matured and somehow sublime therefore. 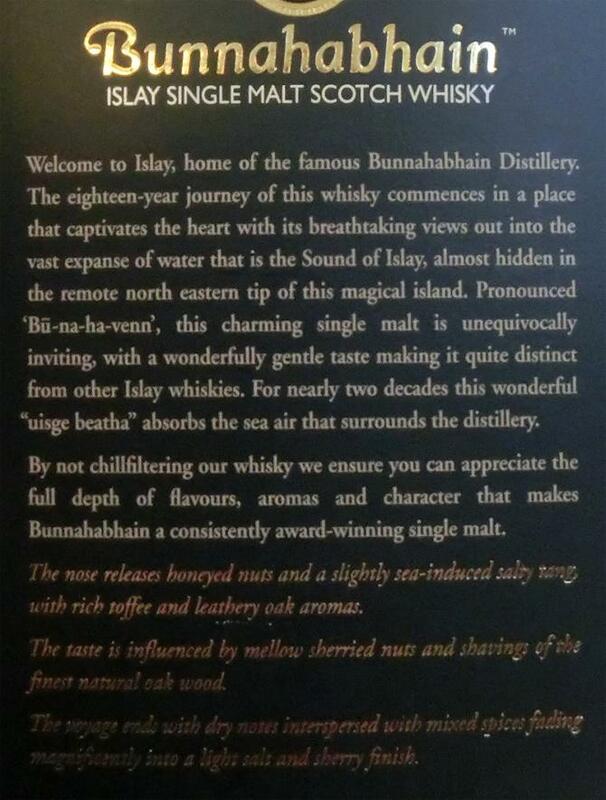 This is one of those whiskys that leave one with a sense of gratitude for sharing in such an experience. Already in the nose this Bunnahabhain is a statement! Fat and full-bodied, all flavors are immediately present. Intense dark soft dried fruit, sour-sour orange peel, pickled raisins, strong salty sea air - as if you were in strong winds on the deck of a shaky ferry! Greasy spiciness, from a little farther on, a bit of smoke blows, a nice musty woody note like from a freshly emptied barrel. Departure light sweet smoke, tart oak and the beautiful sweetness continue even in the very long finish. In addition, after some time, a kind of strawberry and licorice. To the 18er: Well, he likes it. But is not a rocket and also priced for a 18s quite athletic. No bad buy but no case for the bottle bunker. Subtle sherry notes. Light citrus fragrance especially candied orange. Overall, the nose looks very dense and complex. But I do not get that right "through". Alcohol is not noticeable. Smoke very discreet. Good start, but I feel a bit watery for a short time. Then ginger sharpness. Corpse accusations of sherries, through associations with dark fruits and nut noises. Minimal coffee and dark chocolate. Mouthfeeling becomes increasingly creamy. Nutmeg can be guessed. Smoke I take only very discreet, but this is to please. brown sugar, sherry and chocolate nose, then more chocolate and sherry taste. A hint of pepper. Such a well rounded dram. Really nice to drink, maybe even better than that 25.
t is not one of those standard sherry matured whiskies full of raisins, Christmas cake and other sherry-associated features, and I must say I admire it for it. I can imagine myself drinking this with a meal of dry salty spiced meat, somewhere on the sea, some storm churning up, a real Islay fisherman sitting next to me with a big smile on his face. Directly, I find that this has something different, some character of its own. Filled with lots of meat, salt, make that salted fried meat, and Chinese sweet-sour sauce next to some fried duck. After a while it becomes slightly dusty, damp, like walking into a dusty room filled with old books. There is also an old leather arm chair, and somebody left a pair of socks somewhere… Furthermore, there is cake crust, fig sauce, and lots of freshly baked gingerbread. It begins rather dry, but then becomes surprisingly fruity with black berries, raspberries, both in a well-reduced sauce. There is obvious salt, a lot, and it is slightly medicinal with some see weed. No smoke detectable, neither is there any peat present. There are some vague vegetal notes, before it becomes rather bitter and spicy, with lots of ginger, peppered salty fried duck, a few pieces of bitter chocolate, and strong coffee. The finish is particularly spicy. Also, that's delicious again. More Sherry influence than the 12er. Bunnahabhain can do something. But I try a bit in the apartment, to draw a real conclusion. I'm not sure if I like the 12 or 18s better. He has in comparison to the 12er already more sherry. That is not very sweet, but rather goes into the sour. Red berries (blueberries, red currant, Josta). Then some rum raisins. Bit of nutmeg. Aronia honey. Red wine. Again nice creamy mouthfeel. Fugde. In the mouth, the red fruits are sweeter. Red fruit jelly. Fresh plums. Red gooseberry Then it tingles and blood orange comes. After that the oak spreads out.